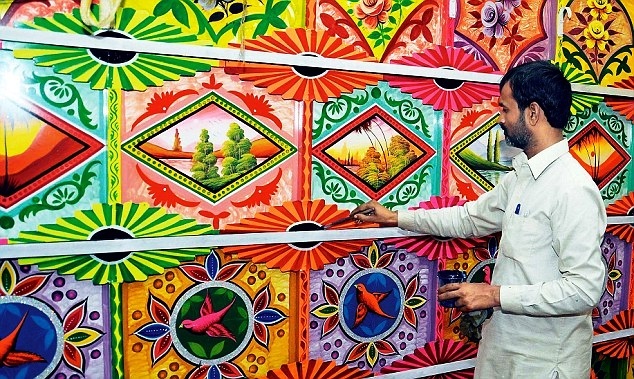 Around the world, truck art from Pakistan was celebrated and often combined with local cultural traditions. In September, truck art was prominently featured at the Hindu festival Durga Puja in Calcutta. Though he traveled to India with the expectation that he would be painting a truck, artist Haider Ali painted one of the pandals, or structures used to carry the Gods, that are paraded during the festival. Truck art was selected as a theme for the Durga Puja because of its potential to build relations between the two nations. The music and film stars who are common subjects of truck murals, such as Madhuri Dixit and Ataullah Khan, are an important common element. The Daily Mail has some pictures of the pandal while Haider Ali was painting.